I'm back for another week of Winnie & Walter creations. Today I have used book paper for my cards. I have an old book that got damaged in a move so pages was missing and I keep it close to use for mixed media projects and other crafty things. I love the texture the printed text gives to everything. For my projects today I used Gesso to cover the pages first to make sure the water from my watercoloring would not damage the pages, and I also like it when just some of the structure of the text is visible under the color. For this card I used In Bloom: Renee's Leaves and stamped the images in black and heat embossed the images before coloring them with watercolors. I used the Essentials: Audrey Cutaways to cut out a white piece of cardstock and stamped the text from Wishing You with Evelin T Designs and gold embossed it. 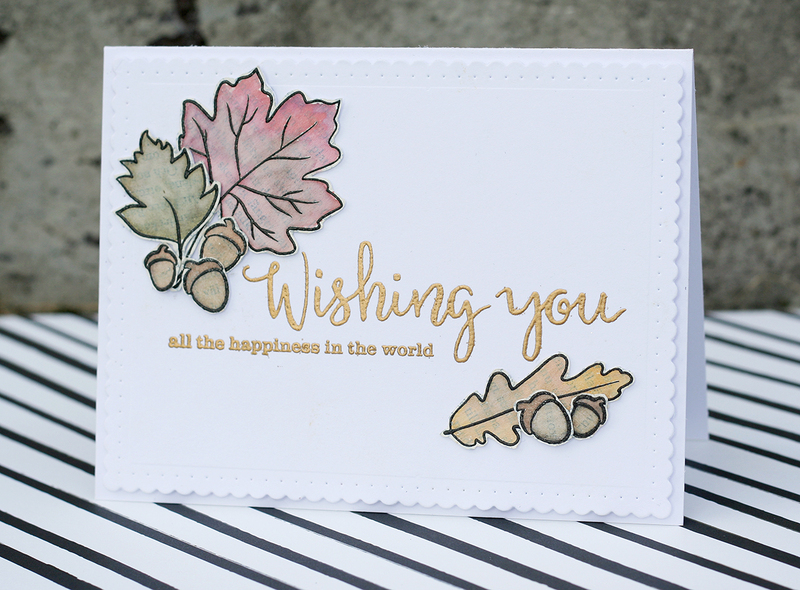 I adhered all my colored elements around the text for a clean and simple autumn themed card for a friend. Thank you for all the sweet comments and to Shay for inviting me to the Winnie & Walter blog. I have read all of your lovely comments and I will get around to answer every single one but it's been a busy week. They really made me happy so thank you. 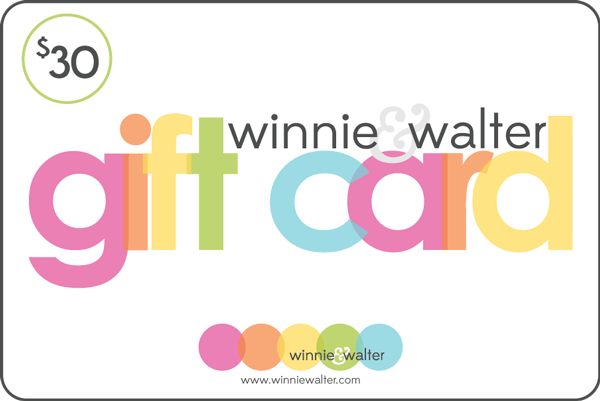 And keep commenting on any (or all) of my Leading Lady posts here this month, you will be in the drawing of a gift card (a coupon code which does not include shipping & handling) for the Winnie & Walter shop that I will give away after my last post for the month is up. My last post is on October 29 and I will draw a winner one week after that on Nov 5th. 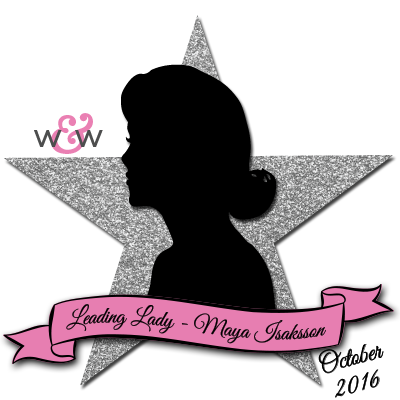 I will select a comment from one of the five Leading Lady posts here in the blog and the winner will be announced here in my blog. Thank you so much for stopping by and make sure to visit Winnie & Walter to see the rest of my cards made for this week. And I'll be back next Saturday for more Winnie & Walter inspiration! I like the subtle design it adds! Great effect with the Gesso layer! This is just gorgeous! I love the sentiment in gold! It is so perfect for fall! Love the card. I also love it that you encourage people not to ruin perfectly good books for the book paper. Well done. great cards again this week! that tree trunk one really pops! 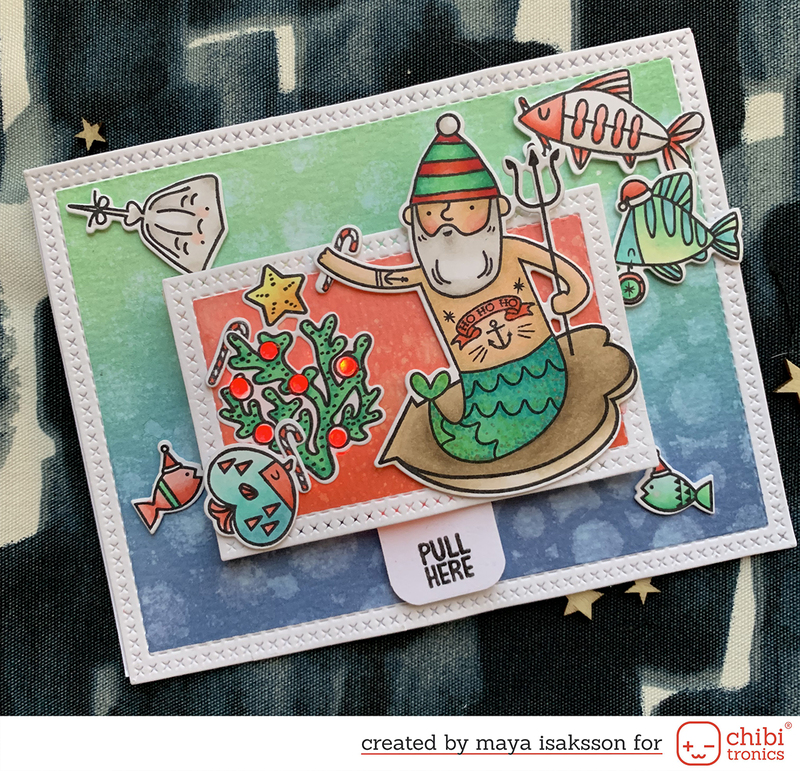 I love it when designers use stamp sets I have in my stash! This is very pretty! Your cards is so lovely love your layout and colours choices. I love the book paper! Lovely! This card is really cute! Simply but amazing. And hats off to your neatness. Now why haven't I ever thought to stamp on patterned paper? This book print really looks fantastic, Maya! LOve the pastel colors this week, too! Your cards are amazing, such a variety and the coloring is outstanding! Beautiful and so clever to use old book pages. Pretty card and subtle colors. Amazing texture, and I love the beautiful simplicity of this design. Thanks for sharing your amazing inspiration. Your 3 cards are all so lovely! I love how you've used the book paper and the watercolouring on the last card is just so pretty! The fond sentiment is lovely, you showcased that well with the clean lines of the images. Bravo!! So very sweet. Love this CAS but warm look. I LOVE all of your cards and will become a subscriber!!! I have another question- did you cut the leaves with the dies or the Cutaways? I really like the idea of repurposing old books. I will just have to go buy an old book at our local thrift store! :) Thank you so much for sharing your cards on the Winnie and Walter blog site!! i do heat embossing alot! Thank you so much! I'm so glad you got inspired :) I actually hand cut those leaves. It's a pretty easy shape and I did not have dies for them, I'm not sure if they have matching dies to be honest. I just made sure to attach them to sturdier paper before coloring them so they were a bit easier to handle. Book paper is so thin and fragile on it's own.